In the case where a resident transfers real estate, there is no withholding tax. However, for non-residents, on the other hand, withholding tax is incurred. The only case where this withholding tax is exempt is in the case where the transfer price of the real estate is under 100,000,000JPY and the purchaser makes the purchase for the residential use of him or herself or its family. In other words, if the real estate transfer price is over 100,000,000JPY, withholding tax will be incurred regardless of its mode of usage. Furthermore, if purchased for the purpose of investment, withholding tax will be incurred. In either case, the withholding tax payer is the purchaser. For example, in the case where the purchase price is 120,000,000JPY, a withholding tax of 10.21% is incurred and an amount of 12,252,000JPY is to be paid to the tax authorities by the 10th day of the following month. Therefore, an amount, after withholding tax is deducted, of 107,748,000JPY (120,000,000JPY – 12,252,000JPY) is paid to the non-resident seller. In the case where taxation is incurred to the capital gain of the real estate in the residential country, tax amount may be adjusted by utilizing overseas tax amount exemption on the amount of tax withheld in Japan or the tax amount after refund requests are made. Furthermore, in the case where the range of taxation in one’s residential country is limited to domestic income such as in Singapore, tax declaration and payment on capital gain in Japan is not necessary. Singapore, Malaysia, Thailand, Brunei, Macao, Hong Kong, Philippines, Taiwan, Fiji, Anguilla, Bahamas, Bermuda, Cayman, Guatemala, Costa Rica, Panama, UAE, Bahrain, Kuwait, Oman, Qatar, Saudi Arabia, etc. In the tax treaty signed by Japan, similar to the OECD Model Treaty, primary taxation right is given to the country of which the real estate is located, and profit due to real estate transfer in Japan is taxed according to the laws of Japan. ※An estimate acquisition fee may be used regardless of whether or not the purchase price is known or unknown. Excluding a certain amount of transfer loss of residential asset, profit and loss may not be totaled with other income. 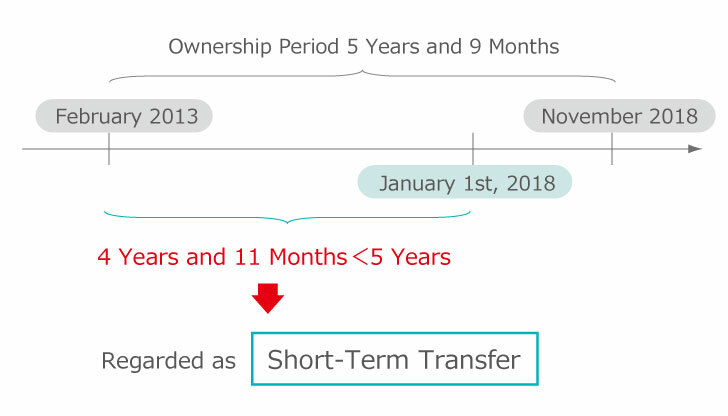 Judgement is made by calculating the length between the date of transfer when purchasing to the date of transfer when selling, but this may also be judged according to the date of the sale purchase contract.